At a recent SYMAAG meeting, our co-chair John Grayson reported on his recent fact-finding visit to Ireland. He visited sites of Direct Provision, Ireland’s system for segregating people seeking asylum. He also interviewed some of the people who have been subjected to Direct Provision and have spoken out against it. In the first of a series, John Grayson examines the Direct Provision (DP) system for asylum seekers in Ireland. Part-two will examine the private companies involved in providing services under DP. In a room in the Tralee International Resource Centre in County Kerry in the South West of Ireland, Shahidah had brought me to meet two residents from Tralee’s two DP Centres. Ten years ago, when there were 40 women and 45 children in the Johnston Marina centre where Christine lives, there was a hunger strike to protest about conditions. 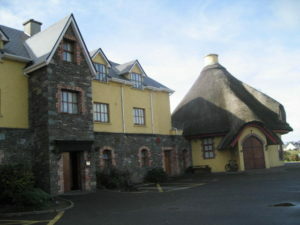 In 2013 the Tralee International Resource Centre was one of the sponsors of the national ‘End Institutionalised Living’ protests held throughout the country, which included a demonstration in Tralee town centre. Charles had prepared for our meeting by writing a detailed list of points he wanted to raise with me. Charles told me of his despair at ‘feeling useless, defenceless, and confused’, and admitted he had felt suicidal at times. ‘In there, time turns against you, you feel ashamed of living in Direct Provision. The racism makes you feel you have no respect in society even amongst other asylum seekers. Other people in the centre suffered racism and abused people like me as a defence mechanism, facing racism by harming good people.’ He was worried about his professional skills as a surgeon deteriorating with his forced absence from practice. ‘We may be banned from working but they should allow volunteering for professional people, it is about more than just the money.’ Now he was leaving Direct Provision he was obviously very anxious about facing ‘real life’ again. DP centres are not closed detention centres, new asylum seekers ‘decide’ whether they go into the DP centres and are free to leave. In 2015 there were an estimated 7,937 people in the Irish asylum system, 45 per cent living in DP accommodation, and 55 per cent living ‘outside Direct Provision‘. The DP system commenced in April 2000, offering asylum seekers bed and board accommodation, and an allowance of €19.10 a week per adult, with an additional €9.60 a week per child. The system of DP also provides health care through the medical card scheme, and education up to the age of 18 for children of asylum seekers. Asylum seekers are not entitled to any other form of welfare payment. They are not allowed to work, and Ireland is the only EU state with a complete prohibition on working. If they decide not to stay in the centres they become destitute and homeless. Asylum seekers in DP are dispersed throughout Ireland, often in disused holiday camps, hotels, convents, hostels and caravan sites. Many of the DP centres are in remote rural or coastal areas. In these areas, the cost of living is often higher than in Dublin and the €19.10 buys less, and the value of the payment has been further eroded by inflation over the seventeen years it has remained unchanged. Direct provision fosters poverty and exclusion within Irish communities. Asylum seekers on direct provision experience poverty to a greater extent than other categories of asylum seeker. Asylum seekers in ‘direct provision’ had household incomes which fell below the 20 percent poverty line. The extreme poverty experienced by asylum-seeking children in “direct provision” is a direct outcome of current asylum seeker policy. As the number of DP centres declined there were repeated reports criticising the DP system, most of them largely ignored by the government, and some legal challenges. As far as the government was concerned the deterrent system was working – fewer and fewer asylum seekers were coming to Ireland. There were 11,598 asylum applications in 2002, 940 in 2012. By September 2014 the Irish Times published a leaked memo from the Justice Ministry setting out the policy. Their headlines read: ‘Minister says system is “inhumane”‘ but … ‘State fears alternative to direct provision will attract asylum seekers’. The reports on the ‘inhumane’ system had grown, together with hunger strikes and demonstrations by people in DP centres throughout Ireland in 2014. The Irish Ombudsman Emily O’Reilly, in her report in 2013 on a family in DP, estimated that there were around 1,820 children under eighteen in the centres (around 38 per cent of residents) and 640 lone parents. O’Reilly described the DP system as ‘a collective failure of a republic which needs to re-engage with what ought to be its core values.’ She said under the current asylum process ‘an entire early childhood, virtually an entire adolescence can be spent in direct provision accommodation’. The Reception and Integration Agency (RIA) figures for June 2017 estimate that there are still 4,691 people in thirty-two DP centres across 16 counties in Ireland. There are 1,248 children under 18 in the centres, 472 of these children are under four years of age. In recent years, academic activists, journalists, a tiny number of politicians, and above all people forced to endure the DP system have begun to expose the system in media campaigns and direct actions. May, from Eastern Europe, who had also lived in Eyre Powell, had her second child in the DP system. She told me of her ‘mental stress over years living in overcrowded conditions in one room. “I was always worried about my children”.’ May’s comments about her children in the DP centres are echoed by the findings of a government survey of 110 children in DP centres completed in 2015. 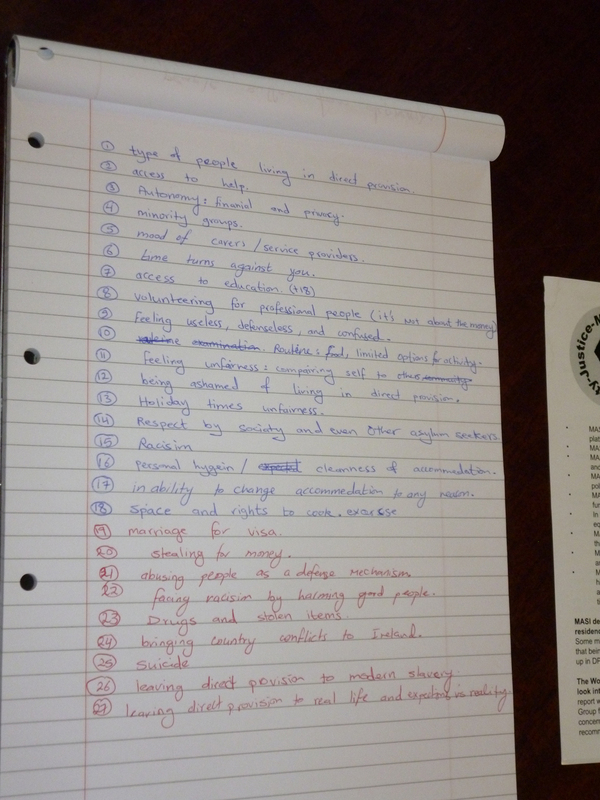 Children described their accommodation as ‘overcrowded’ and ‘dirty’ and the direct provision system as ‘not fair’, ‘not safe’, and many spoke about older men ‘taking over’ the TV and recreation rooms. ‘There are loads of men bothering us’, said one, while another commented: ‘There is so many men, and . . . they look creepy at you.’ The diets were described as ‘horrible and disgusting’ and ‘unhealthy’ by older groups, and as ‘always the same’ and ‘the food has no taste’ by the younger children, with several expressing the wish their mother could cook for them. The Irish government refused to publish the survey until forced to do so this year, on 18 July, as a result of a FOI request from the Irish Times. 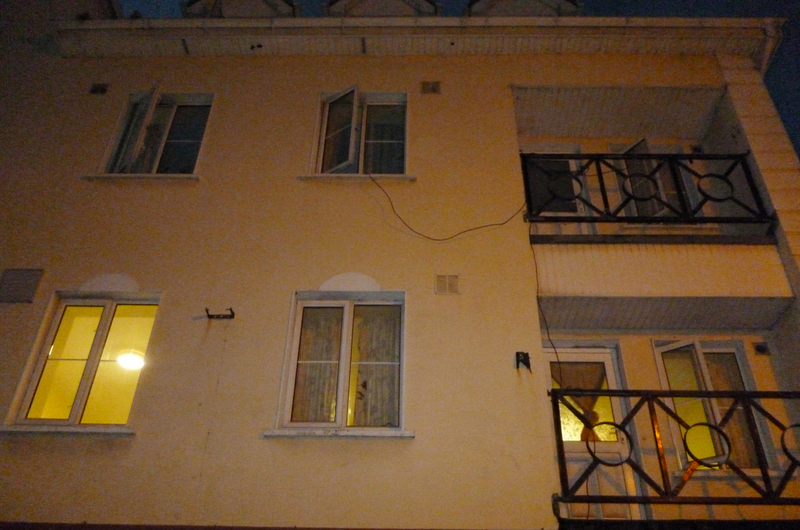 Are cracks appearing in the Irish deterrent asylum system? Then on 14 June, Ireland’s Taoiseach (Prime Minister), Leo Varadkar, announced an increase of €2.50 per week for adults and €6 per week for children to benefit more than 4,000 adults and children living in Ireland’s accommodation for asylum seekers, the Direct Provision (DP) centres. The rate for children will rise from €15.60 to €21.60 per week and for adults from €19.10 to €21.60 per week from August. The adult support rate remarkably had remained at € 19.10 for seventeen years ever since the DP Centres were set up in 2000. 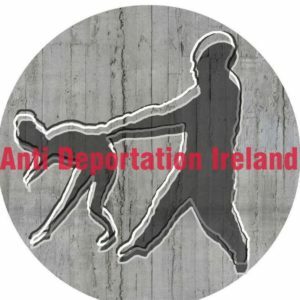 The new Irish International Protection Act (IPA) which came into operation in December 2016, replaced the extremely time-consuming process for asylum seekers: first claiming asylum through the ORAC (Office of the Refugee Applications Commissioner), then appealing a negative decision to the Refugee Appeals Tribunal (RAT); and finally, if unsuccessful, making a claim for subsidiary protection to the Minister for Justice, for example, claiming that they cannot be returned safely to their country. All these stages meant long delays, often of years, spent in DP. In 2015 there were ‘approximately 1,000 people involved in judicial review proceedings relating to the various stages in the system, of whom 66 per cent have been in the system for more than five years.’ The new law, which was designed to streamline the application process for asylum seekers to reduce waiting times for decisions, seems to have stalled with the revelation earlier this year that 4,000 cases had been handed on to the Office for International Protection from the previous system, and that these would be given precedence over new claims. The IPA also increased the State’s powers to enforce deportation orders. Lucky Khambule, on 19 June, described the rise in deportation proceedings since the introduction of the IPA as ‘alarming’. The introduction of the IPA also seems to signal a new period of asylum refusals. Figures up to May this year show that only 101 people have been granted ‘permission to remain’, compared to 532 in total over 2016. Since 2007, 23,506 people have applied for asylum status in Ireland, and the average rate of refusal is 86 per cent. Just 3,285 asylum seekers have been granted official asylum protection in Ireland in the past ten years. The names of asylum seekers and refugees who spoke to me about Direct Provision have been changed. Thanks to Shahidah Janjua, Zoryana Pshyk, and Lucky Khambule for their hospitality and assistance with my research and solidarity trip to Ireland. Liam Thornton, of University College Dublin (UCD) contributes regular legal and other comment on DP to the ‘Human Rights in Ireland’ website www.humanrights.ie. And photos and material on the Irish Direct Provision centres can be found at these very useful archives: Asylum Archive, Ireland (2014) Direct Provision Centres and Asylum Archive, Ireland (2014) Resistance 2014. References:  The Tralee DP centre features on the current (2017) ‘welcome’ home page of the RIA (Reception and Integration Agency) website. Fanning, B. and Veale, A. (2001) Beyond the Pale: Asylum Seeking Children and Social Inclusion in Ireland. Dublin: Irish Refugee Council and Combat Poverty Agency, July. Download here. Irish Government Department of Justice and Equality/An Roinn Dli Agus Cirt Agus Comhionannais (2015) Working Group on the Protection Process: the McMahon Report, Dublin, June. Irish Refugee Council (2013) Direct Provision: Framing an alternative reception system for people seeking international protection. Dublin: Irish Refugee Council. O’Reilly Z. (2012) In between spaces’: experiences of asylum seekers in the ‘direct provision’ system in Ireland PhD. Departments of Geography and Media, Faculty of Social Sciences, National University of Ireland (NUI) Maynooth, October. A Hundred Thousand UnWelcomes. Lucky Khambule speaks about Direct Provision on YouTube, published 21 November 2016.